Tony's Kansas City: LAST KANSAS CITY MAYOR SLY 'STATE OF CITY' TALK TODAY: WHAT WILL HE SAY?!? 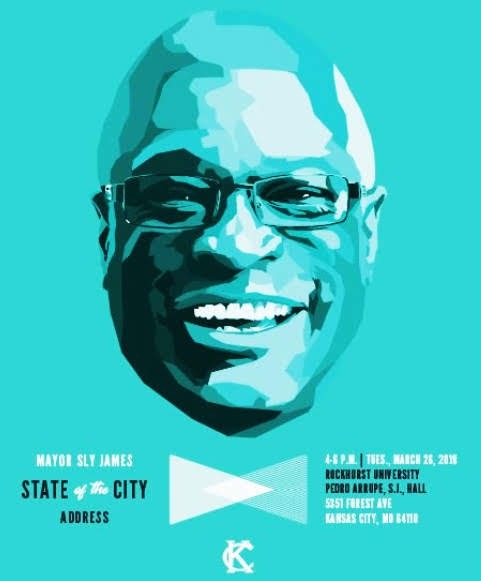 LAST KANSAS CITY MAYOR SLY 'STATE OF CITY' TALK TODAY: WHAT WILL HE SAY?!? The lame duck Mayor is wildly unpopular as he leaves office and on the brink of finishing his term backing a loser Pre-K sales tax. He was never beloved but after delivering one tax increase after the next to The Greater Kansas City Chamber of Commerce & The Civic Council . . . He earned respect among elites for his ability to play spokes-model. Sadly, now that his credibility is used up . . . His former big money friends don't have a lot of use for him by way of public office representation . . . But more importantly . . . We ask our blog community . . . PREDICT MAYOR SLY'S PARTING WORDS FOR KANSAS CITY!!! - The water is brown but City Hall says we should still drink it down. Slowly. - Murders continue to trend upward and KCMO ranks as the #5 most dangerous town in the nation. - Streets are filled with potholes and only Ward Parkway is getting things fixed. And so, here's the invite and a preview of the swan song of this social media politico. Lame ducks don't say much. They mostly just quack a lot. He can say whatever he wants before he leaves. Just as long as he leaves. He'll peedle the same crap that he has for years and just said at the "groundbreaking" for the airport terminal. KCMO has become not just the center of the country. It's the envy of the entire civilized world. All the millenials are moving downtown! Downtown is a vibrant, energized, sophisticated, diverse urban environment! A new airport terminal will bring many millions more tourists! And all this and more are due solely to his amazing leadership! Surely the public will respond and give him the keys to another vault of public money. A legend and celebrity in his own mind. I hope he states his views on unsolicited bulk email. His words will be: I won. You lost. "- Streets are filled with potholes and only Ward Parkway is getting things fixed." Wrong. I was on Ward Parkway Saturday, and not even it is getting fixed. ^^But were you on it today? because it sure as hell is today! Go away troll! He'll preach the same thing his best friend Bill DeBlasio does even though DeBlasio has taken NYC down to the bottom of the cesspool, Sly has done the same to KC. Sly is the most laugh at Mayor in the metro area over and above Funkhouser and so are the people who voted for him. So if you live in the KC city limits don't move to the burbs you won't be welcomed. 8:05: No. I have not been on it since Saturday. I've been taking alternate routes to avoid it. It's great news the city is fixing Ward Parkway. Now, when are they going to fix the other streets, including 75th at State Line with its "welcome to Kansas City" crater? While Sylvester sings the blues, KCMO drowns in the red!!! He'll preach about all the great "momentum" KC has with the street car, the 800-room convention hotel, the airport, etc. What he will omit from the speech is how much debt he and his administration has created over the last 8 years, how many 10s of millions of dollars per year get diverted from city coffers to private entities, and the mass number of tax increases that have been put in place during his tenure. In essence, he'll preach a lot of sizzle but very little (if any) meaningful substance. Won't cost the taxpayers a dime! Keepin' it frosty! ^^ So this Ordinance approves an obligation for the City (i.e. the Taxpayers) to provide to the Industrial Authority $900 million (of our Dollars) so the Authority can issue bonds to raise cash that the Authority will then "lend" to the City so the City can make a start on the new Airport, which "the Airlines are going to pay for" right? Twenty five years in the Municipal Bond business, and this is a new one on me. He will say, (Tony) TOLD YOU SO!!!! Send Tony locations of horrible pot holes and pictures. Lets get this rolling on tagging them and making clear what is out there. This is a participatory citizens brigade calling for an action. Tony's only interest is stirring the pot. He wont lift one fat,greasy finger to do anything to actually help. How can we screw thee? Let us count the ways. Thank you for your leadership & vision. You have established a solid foundation for #kcmo's future! ROFL god the mindless unthinking idiots in this town are astounding. Too bad he has saddled his successor with all the debt and potential to have to pay for the Airport improvements. ...and, yet Gopher is bigly threatened by the truth. See you at the ribbon, er, I mean, pics/vids reveal SOON. Weird.